With the new year upon us, are you ready to reduce the appearance of sun damage, wrinkles, skin discoloration, or acne scars for a healthier, clearer, and brighter complexion? If so, skin-resurfacing with a chemical peel may be a right choice for you. Light chemical peel. This treatment removes the outer layer of skin (epidermis) and is used to decrease the appearance of fine wrinkles, acne, uneven skin tone, and even skin dryness. A light chemical peel can be repeated as often as every two to five weeks. Medium chemical peel. This treatment removes skin cells from the epidermis and from the upper portion of the middle layer of skin (dermis). This type of peel is used to treat wrinkles, acne scars, and uneven skin tone. A medium peel can be repeated after three to four weeks, then every three to four months to maintain best results. Deep chemical peel. This treatment removes skin cells from the epidermis and from the mid to lower layer of the dermis. A deep peel may be recommended to treat deeper wrinkles, scars, or precancerous growths. A deep chemical peel is dependent on your provider’s discretion and typically is only performed once. Wear sunscreen. In order to help prevent irregular pigmentation in the treated areas of skin, be sure to use sunscreen at least four weeks before your appointment. Avoid these cosmetic and hair removal treatments. A week before your scheduled chemical peel appointment, be sure to avoid skin bleaching or facial scrubs. Also, avoid hair-removal laser treatments, waxing, or use of depilatory products on the area to be treated. Chemical peels are performed in your dermatologist’s office. At the beginning of the treatment, your provider will clean your face and may cover your eyes with ointment, gauze, tape, or goggles. Before a deep chemical peel, your provider may numb your skin with a local anesthetic. 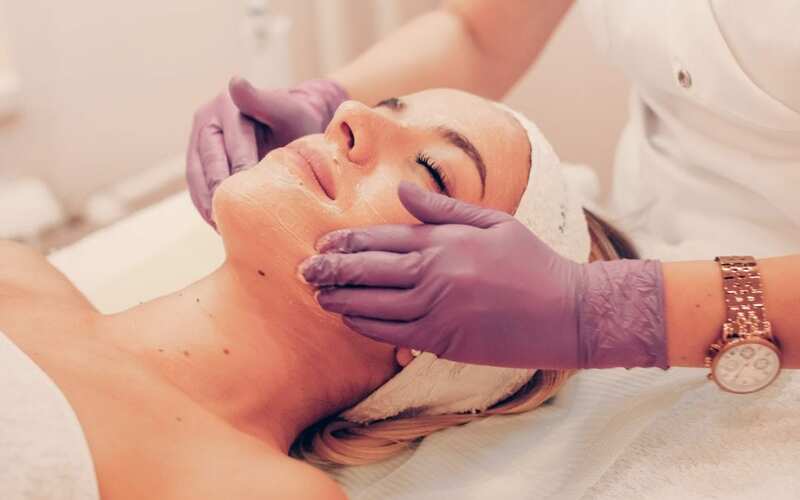 During a light chemical peel, your provider will use a brush, cotton ball, gauze, or sponge to apply a solution which might sting mildly while on your skin. Your provider will apply neutralizing solution to remove the chemical solution at the end of the procedure. During a medium peel, your provider will apply cool compresses to your skin after the chemical treatment. You might feel stinging for up to twenty minutes. After a light peel, treated skin may be red, dry, and mildly irritated. Your provider might apply a soothing, protective ointment or additional correctives. Expect treated areas to take one to seven days to heal. After a medium peel, your treated area will be red, tight, and swollen. Your provider might recommend using ice packs. Treated areas take about one to two weeks to heal. After a deep peel, you’ll experience redness, swelling, and skin burning. Your provider may apply a watertight dressing. Treated areas may develop new skin in about two weeks. Following your procedure, you’ll see improved skin texture, tone and decrease in appearance of wrinkles. Results are more dramatic if you have a medium or deep chemical peel. Because new sun damage can reverse your results, be sure to wear sunscreen on the treated area to protect your skin. Maintain and amplify your achieved results with a personal at-home skincare regimen. Give yourself the gift of a more youthful and healthier look for 2019. Click here to request an appointment today to get started: Request an Appointment.